SAN JUAN, Puerto Rico — After Hurricane Maria made landfall in Puerto Rico on Sept. 20, most telecommunications services collapsed, particularly cell phones and internet providers. People struggled for days to contact their loved ones, and although there have been some improvements, making a call, sending a text message, and connecting to the Internet is still a challenge in most areas. Only certain analog and satellite telephones managed to survive the category-four hurricane, and the landline of Cucina 135, a community center located next to San Juan’s financial center, was one of them. “Having a phone line was an invaluable resource,” said Luis Cedeño, spokesperson for El Llamado, an organization focused on providing support and unifying social movements in Puerto Rico. 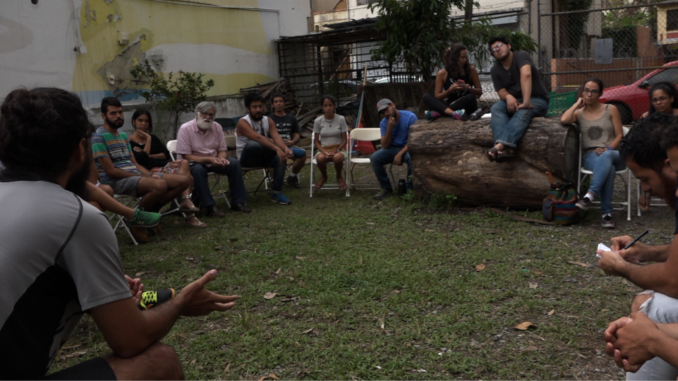 El Llamado (The Call) is supported by the Center for Popular Democracy and is led by a group of organizers from different sectors, including artists, communicators, social workers and student leaders. The second day after the hurricane, El Llamado began calling Puerto Ricans in the diaspora from the landline of Cucina 135 to organize relief efforts independent of government agencies or big NGOs like the Red Cross. Cucina 135 is based in a small house that has been converted into a communal kitchen and meeting space. El Llamado now oversees Cucina 135, which serves as a gathering point for activists in a post-Maria Puerto Rico where they can exchange information and coordinate relief efforts. The main concern of organizers coming into the space was the mobilization of thousands of U.S. troops to the island who were not distributing the much-needed aid, but controlling it. Meanwhile, prices soar and people go hungry. In the rural town of Utuado, about 65 miles inland from San Juan, the military presence is widely visible. The U.S. Army has established a checkpoint at the entrance of the small urban center in this mountain town. Troops were posted three days after the hurricane hit. Still, more than a week later (I visited the town on Oct. 2), residents less than a mile away from the checkpoint had only received one FEMA meal box that contained two bottles of water. In the long term, the objective of the CAMs is to build popular power from within the communities and eventually move Puerto Rico away from its colonial dependency to the United States. 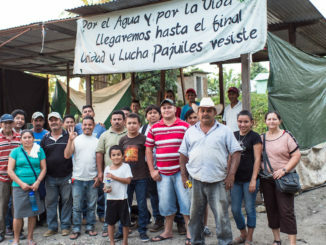 Responding to this official neglect, El Llamado is currently supporting more than 20 grassroots initiatives that range from debris cleaning brigades to agricultural projects to communal kitchens, including one in Utuado that identifies as a Center of Mutual Support (CAM in Spanish). The CAMs fight hunger while striving to raise the political consciousness of participants. Five of these centers have opened their doors since the hurricane. The first one appeared in the city of Caguas; the organizers’ philosophy is to encourage communities to unite and become self-sustaining, “The CAM is the proposal of a new municipality and a new country. The CAM is the new municipality of Caguas… through structures like this, of people participation, I know that we can construct other things,” said Giovanni Roberto, a former student leader at the University of Puerto Rico and current coordinator of the CAM in Caguas, which serves about 600 meals per day. Since 2013, Roberto has run a project called Comedores Sociales (“Social Diners”) that seeks to provide food to university students who struggle financially. This served as a foundation for the establishment of the CAM. In the long term, the objective of the CAMs is to build popular power from within the communities and eventually move Puerto Rico away from its colonial dependency to the United States. Currently, Puerto Rico imports about 88 percent of its food, and, because of the Jones Act, supplies can only arrive on U.S. vessels. This means that even aid cannot come from countries other than the United States. The colonial status creates a major humanitarian problem, particularly after a catastrophe like Hurricane Maria, when Puerto Ricans are facing shortages of water, food and medicine on a daily basis. Before Hurricane Maria, most activism in Puerto Rico was centered around the issue of the $74 billion debt and opposition to the 2016 Puerto Rico Oversight Management and Economic Stability Act (PROMESA). The latter established a seven-member unelected oversight board that controls Puerto Rico’s finances. However, activists opposing the payment of the debt and PROMESA were focusing on hunger and poverty prior to Hurricane Maria. The catastrophe accelerated efforts already underway as the economic crisis and precarious position for the masses of Puerto Ricans is worsening even more. After a community breakfast in Río Piedras, I sat down with Marisel Robles, a spokesperson from the group Promises Are Over (SALP in Spanish). SALP has been organizing against PROMESA since President Barack Obama signed it into law. 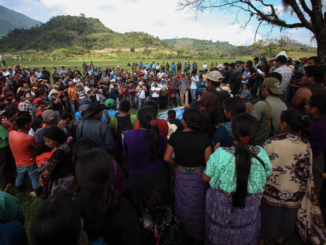 Presently, Robles is one of the coordinators of the Olla Común (Common Pot), another CAM initiative. As some volunteers cleaned the support center, and others began preparing the meal for the next day, Robles stated, “Hunger was already being discussed, and the level of poverty was being discussed. But after the hurricane hit us so hard, the veil of everything was lifted.” The Common Pot in Río Piedras has around 30 volunteers that coordinate the distribution of 150 breakfast meals per day from Monday through Saturday. 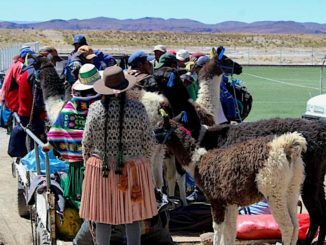 But the Common Pot should not be mistaken for a cafeteria, as Scott Barbés Caminero, coordinator of the CAM and member of the SALP, emphasized when addressing residents of Río Piedras before breakfast, “The Center of Mutual Support is not a cafeteria. It is a space where we come to help each other in light of a situation where the government collapsed after Hurricane Maria,” Barbés Caminero said. The Common Pot operates under an egalitarian system, which organizers call Sistema de Aportación (Contribution System). And while all comers are welcome to have breakfast, the objective is that everyone becomes involved with the project by volunteering for work, donating food items or contributing money. “If we all are doing this, Puerto Rico would be advancing,” said one man as he waited in line for breakfast.